5 Seconds of Summer are an Australian band who have more recently become very popular in the UK, as well as in many other countries around the world. I first heard of them about two years ago through an Australian girl I follow on twitter who's loved them since the beginning, however I'm someone who often resists new music by new artists, as often when I invest my time into upcoming artists on YouTube I'm disappointed. In this case though, I wish I had started listening to their covers when I first heard about them (I made the same mistake with Lawson). A few months ago one of my friends properly introduced me to their music, basically just by telling me she loved their songs and since I will - although perhaps reluctantly - listen to anything I'm recommended, I got on YouTube and had a listen. And the first video I clicked on (a song called Wherever You Are) won me over immediately. 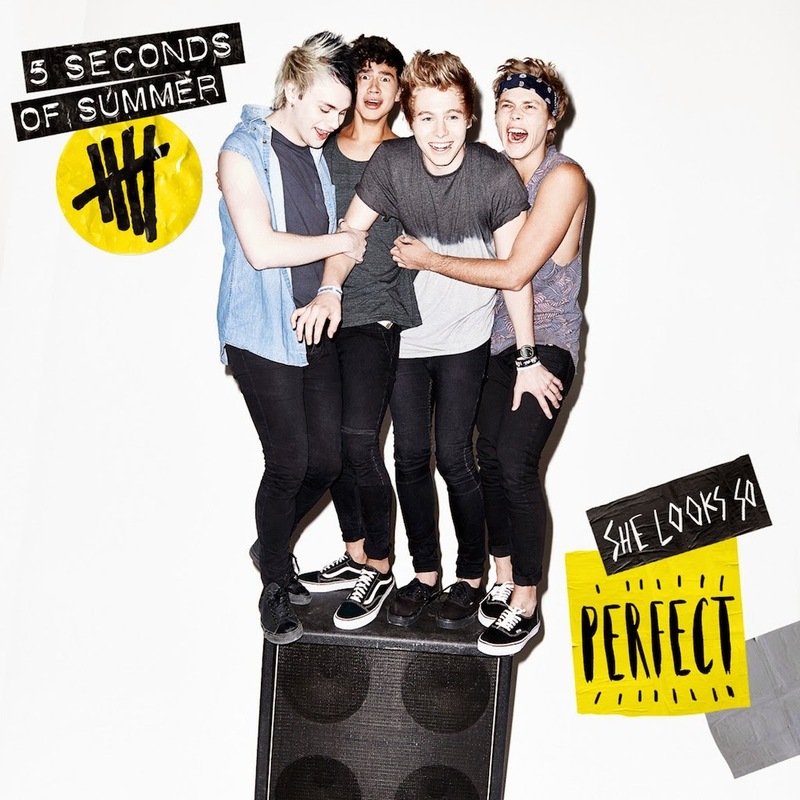 Their first single, She Looks So Perfect, was released on Sunday (23rd March 14) along with an EP. Their sound is notably Pop/Rock, with perhaps a hint of punk, although this is seemingly buried under the catchy riffs and hooks that the likes of One Direction would be likely to envy. The song was co-written by members Michael and Ashton, along with songwriter Jake Sinclair. The song is very quirky lyrically, and works well with a dominant electric guitar line that really pushes the song forward. The chanted 'hey' featured throughout is something that I've heard even my dad sing along to when he's heard the song on the radio. The lyrical concept is something kind of warming: a girl can be wearing men's underwear with her lipstick smeared and yet a boy would still think she was perfect. It reminds me of the general concept of young, free love. I think that most teenagers would be able to relate to the song in some way and it's a song that I think would sound completely at home at any festival. And I can't say I'm at all surprised it's number one on iTunes. This song was written by the band with Mike Duce and Dan Lancaster and I love the extended metaphor. I think that writing about a tough relationship as though it were a film is a very original idea, and very different to the majority of contemporary heartbreak songs heard nowadays. It's a song that sounds somewhat experienced, and yet, equally very naive; I think it really captures the whole concept of young love, with the expectations for everything to be like a romcom, whereas actually, more often than not, it's pretty rubbish ('started out like in the movies, but it ended like a bad dream'). Overall it's a strong song with that special something that makes it very individual. Guitarist, Michael, wrote The Only Reason, with Steve Robson and Busbee. In short it's a ballad about heartbreak; but there's the underlying emotion of pure infatuation which leads to personal heartbreak rather than an upset caused by someone else. I really like the bass in this song, as usually in any kind of ballad the instrumental range is incredibly limited (unless you're Mcfly and want to whack in a full orchestra every now and again), but you can really hear everything in this. I like that it's still rock influenced despite the ballad conventions. It's catchy and rhythmically upbeat despite the lyrical message, and that just really works in this song. What I Like About You is the final song on the EP, and is a song by The Romantics, originally released in 1979. Whenever I listen to a cover of a song I haven't previously heard of I go straight to the original for comparison, and I like how 5SOS have managed to keep the song very upbeat and yet equally bring their own modern rock influences further forwards, for instance, substituting the electric guitar in the place of the original harmonica. It's a great version of the song with notably strong vocals. Generally speaking, the EP is fairly diverse, and yet still uses the same instruments with the same overall style. I would recommend these songs to anyone who hasn't heard them and is into music from the 70s onwards.